This will allow us to have a fixed IP form within the scope of dynamic IPs that we are assigning to different devices connected to the network. Even the simplest home network begins to have multiple devices and this will go into more in the near future when, i.e. the Internet of Things (IoT) dominates our domestic and professional life. DHCP is used when we connect the mobile to the home network, in the college, etc. It is a system that assigns IPs dynamically, always based on a “scope”, or IP store that it has configured. The DHCP server assigns IPs correlatively, as devices are entering the network, or randomly (this depends on the DHCP server). There is a method that allows us to have a fixed IP within a DHCP, but requires some configuration, usually do by a network administrator. A reserved allocation must be within the DHCP range. We can not put a fixed IP to a device if that IP is not within the range of the DHCP. In turn, a server usually has the potential to have different areas. But this already depends on the capacity of our router, server, etc. The goal is that the device, whether computer, phone, NAS, access point, always has the same IP and therefore can be easily located to offer an easier configuration or can provide certain services to other devices in the network or out of it. In short, what is expected is the device, despite having the IP configuration in automatic, always count with a fixed IP. A DHCP reservation always makes a direct relationship between the assigned IP and a specific Mac address. As you know, every device with a network connection, whether wired or wireless, has a unique address called Mac. It’s like the number of a car’s rack or the serial number of your computer. It is unique, or it should, and is easily manipulated. 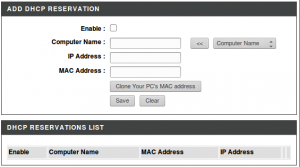 Manual Assignment: The assignment uses a table with MAC addresses (acronym for Media Access Control Address, which translates as Media Access Control address). Only hosts with a MAC address defined in that table will receive the IP assigned in the same table. This is done through the ethernet hardware option combined with deny unknown-clients. Automatic Mapping: An available IP address within a given range is permanently assigned to the host that requires it. Dynamic Assignment: A range of IP addresses are arbitrarily determined and each host connected to the network is configured to request its IP address from the server when the network device is started, using a controllable time interval (default-lease-time and max -lease-time), so that the allocation of IP addresses is temporary and these are reused dynamically. The reservation will ask for a Mac Address, an IP (whatever we want within the scope) and, only sometimes, a Host or computer name (unusual and is only for internal management, will not affect the actual location of the device). All this data can be extracted from the list of DHCP clients that the router already has. Some even allow you to make the reservation based on the list with the push of a button. We can also find this information in the details of the network interface with commands such as ipconfig in Windows, or ifconfig in Linux, etc. Write this code in the MAC Address textbox. Save the changes and restart the computer and the router. Warning: There is a risk of generating a duplicate IP address by doing this procedure, handle this information with care. © 2019 192.168.0.1 IP	- Theme: Patus by FameThemes.